Physicians and other providers at the UofL Physicians Novak Center for Children’s Health began seeing patients this week, marking the facility’s official opening. 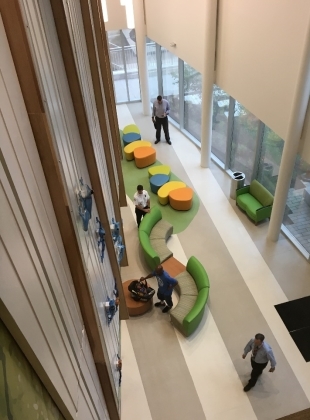 “We are thrilled that the years of careful planning and construction are behind us, and we have opened our doors,” said Kimberly Boland, M.D., interim chair of the University of Louisville Department of Pediatrics. “This facility enables us to transform how we deliver care by having multidisciplinary teams located in one space so they can meet simultaneously with our patients and their families. Among the first patients seen in the new facility was 11-month-old Zayne Griffith, a patient of pediatric cardiologist Craig H. Alexander, M.D. Zayne was born with an atrioventricular canal defect, which occurs when there is a hole between the heart's chambers and there are problems with the valves that regulate blood flow in the heart. He also has Down’s syndrome. UofL doctors successfully treated Zayne for his heart condition with surgery in February, said his mother, Maranda Griffin, who brought him in Tuesday (June 26) for follow-up echocardiogram and electrocardiogram tests to monitor his heart. Griffin praised the new Novak Center. “This is so nice,” she said, laughing before adding, “nicer than the old office we went to in the Children’s Hospital Foundation Building. It’s much bigger. There is so much more room for Zayne’s stroller, and parking is so convenient, just across the street in the (Chestnut Street) garage. The new 176,000-square-foot facility at 411 E. Chestnut St. enables providers with the UofL Department of Pediatrics and UofL Physicians to accommodate an anticipated 135,000 patient visits annually in the new center – now one of the largest and most technically advanced pediatric outpatient centers in the United States. The building’s namesakes are retired CEO of Louisville-based Yum! Brands David Novak, his family and their foundation, the Lift-A-Life Foundation. Each floor in the eight-story building has a different predominant color and animal theme to help both children and grownups identify it. Because the Novak Center houses general, specialty and subspecialty pediatrics services in a single building, patients and their families have all their needs handled in one convenient location. All pediatric providers are in a single building to ensure a multidisciplinary approach in providing care. Innovative clinical and research programs not only provide the latest advances in treatments and cures but also create and develop them. The environment enables staff to explore new initiatives, including holistic life style approaches to diseases and conditions that impact children. Both basic and clinical research is carried out at the site and will help UofL attract new researchers. Education and training provided to medical students, residents and fellows is enhanced, giving them first-hand experience with interdisciplinary learning they can take directly into the patient exam room. Also included in the facility is the Wendy Novak Diabetes Center, created in 2015 with support from the Novaks to provide comprehensive diabetes care as well as access to clinical research trials that sometimes are patients’ only chance at diseases management and survival.